Are you sometimes shocked at what people will share on social media or quote in conversation? 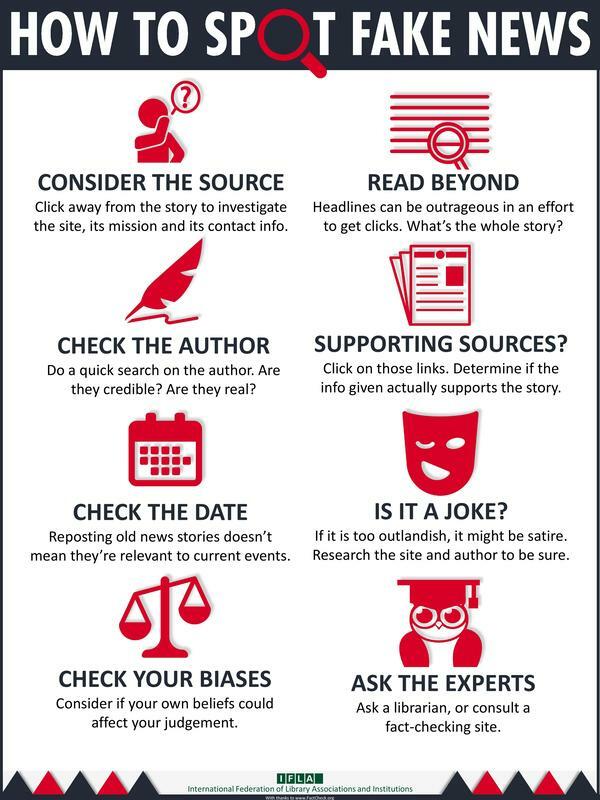 ​Use the resources below to find accurate information to know what's true and what's not! A nonpartisan, nonprofit “consumer advocate” for voters that aims to reduce the level of deception and confusion in U.S. politics. This site monitors the factual accuracy of what is said by major U.S. political players in the form of TV ads, debates, speeches, interviews and news releases. Their goal is to apply the best practices of both journalism and scholarship, and to increase public knowledge and understanding. Nonprofit national news organization that works to check specific statements made by politicians and rates them for accuracy. Their Truth-O-Meter rates statements on a range of "Pants on Fire" to plain old "True." Each rating explanation is given when you click on the statement. Nonpartisan, independent and nonprofit, the Center for Responsive Politics is the nation's premier research group tracking money in U.S. politics and its effect on elections and public policy. Their mission is to produce and disseminate peerless data and analysis on money in politics to inform and engage Americans, champion transparency, and expose disproportionate or undue influence on public policy. This independent site is a well-known and long-running (since 1994!) site that investigates urban legends, hoaxes, and folklore. Hoaxes spread misinformation, waste bandwidth, and lessen the effectiveness of the Internet as a communication tool. This company checks internet and email scams to alert internet users. A non-partisan website where Internet users can quickly and easily get information about eRumors, fake news, disinformation, warnings, offers, requests for help, myths, hoaxes, virus warnings, and humorous or inspirational stories that are circulated by email. While not a fact-checker in itself, it's a tool that you can use to fact-check online. This site lets you look at what a site looked like (and, more importantly, what it said) at a particular time. A web-based, non profit research and information center dedicated to comprehensively monitoring, analyzing, and correcting misinformation in the U.S. media. A nonpartisan national education nonprofit that works with educators and journalists to teach middle school and high school students how to sort fact from fiction in the digital age. ....But you can't lie on the internet! You may have seen the following commercial, which illustrates the importance of fact-checking in your personal decision-making. Check it out!